All Leineweber Camshafts are manufactured in THE UNITED STATES OF AMERICA from heat-treated Aircraft Quality Materials. 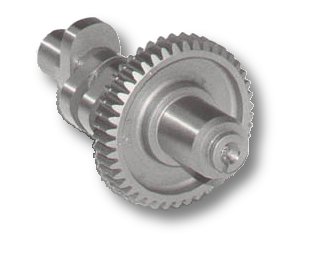 The gear is pressed on in the conventional manner. Leineweber Camshafts encompass cam designs that produce more power than provided by other cams. Leineweber camshafts are the constant velocity type, which lifts the valve very quickly to its maximum lift. Therefore the valve is at or near maximum lift for most of the duration, creating a wider torque range. Naturally the cam with the longer period of maximum lift will have superior flow characteristics. All Leineweber camshafts have superior duration, which offers a wider torque range than other manufacturers. ·Valve timing is checked at .020". ·Custom cam grinding is available. ·Call and let us discuss your special needs. ·Super charged & Turbo cams available for racing engines. ·For a perfect fit we will install your stock gear at no extra charge. ·Retail & Dealer Sales Only, 10% discount on four (4) or more cam ordered at the same time. International payment can be made by credit card through PayPal.com!